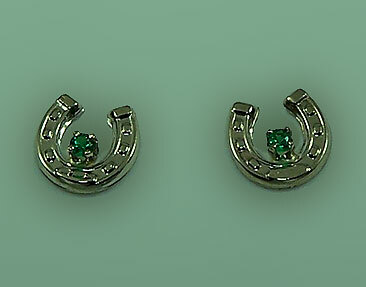 "Small Horseshoe with Emerald Earrings"
Small Earrings great for any age! Add a little bling to your western side. Cast in 14kt white gold and set with .04 ct of genuine Emeralds. Have it your way with any style birthstones you choose. Simply fill out the request form below to design your own pair of horseshoe earrings today.